Golden Rule Bazaar, Honolulu, H.I., printed corner on blue cover bearing 5¢ ultramarine (39) tied by "Honolulu, H.I. 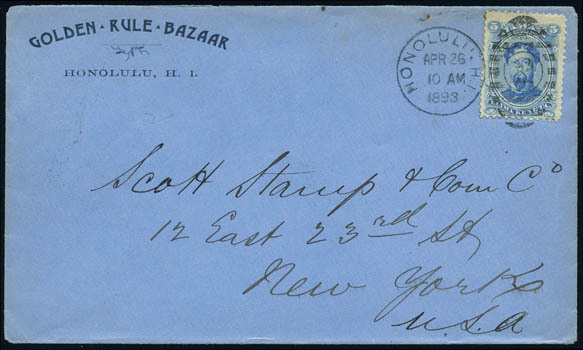 Apr 26, 1893" duplex to Scott Stamp & Coin Co., New York N.Y., reverse with San Francisco Paid All (5.3) transit and New York (5.8) arrival cds, Very Fine and attractive. Peters-Uota No. GRB-CC-1 Estimate $200 - 300. Golden Rule Bazaar of Honolulu was an island curios and bazaar merchant established in 1892, successors to A.L. Smith. A link back to Sale 65 - Lot 325, along with its description, will be appended to your message.